Rose Absolue is absolutely lovely. It has the delicate, slightly fruity scent of the Angel Face lavender roses I grow in my garden. I most often use it to layer with one of two different oriental fragrances that I have to add lightness and subtlety. I had been searching and sampling other rose scents -- Jo Malone, Tom Ford, Penhaligon, etc., but none of them seemed fresh and true like this one does. I am so happy to have found this and will buy an extra bottle since I want it to last my whole life! 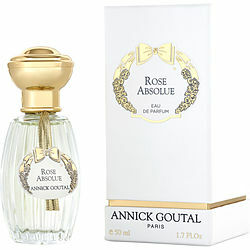 I have been testing many different rose fragrances and this is the only one that actually smells like a fresh rose on my skin -- very delicate, like the gentle scent of the Angel Face roses that I love. I layer this with other fragrances for a subtle effect or just wear it by itself. It doesn't smell "perfumey" or cloying ever. A masterpiece, in my opinion. What a wonderful perfectly rose smell. Not manufactured smelling; not old lady smelling. Smells like a fresh rose. Just wonderful! Makes me feel joyous and it makes me smile. Fragrance does not last as long as I'd hoped but still love this.